As many of our floral prints were taken from original early C20th aprons we are delighted to have produced this wrap over apron kit. 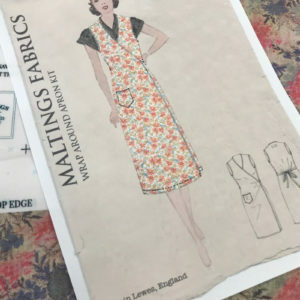 Unlike most clothing kits, the pattern shapes are printed directly onto the fabric so there is no fiddly paper pattern which needs to be cut out and pinned. Just cut out the printed section of the fabric and follow the simple instructions. There is a choice of 6 designs as standard. Contact us for a bespoke option. View basket “The Blanket Sample Pack” has been added to your basket.